Hurricanes vary widely in size, location, and damage. Some storms are very compact and only have a few bands of winds and rain behind them, while other storms are looser, so the bands of wind and rain spread out over hundreds or thousands of miles. There are four weather alerts for both hurricanes and tropical storms. Depending on where one is located in proximity to the storm, they may find themselves in one of the four alerts. The alerts include a tropical storm watch, tropical storm warning, a hurricane watch, and a hurricane warning. Tropical storm watches are issued when sustained winds from 39 to 73 miles per hour are possible in the area within 36 hours. A tropical storm warning indicates that these conditions are likely in the area within 24 hours. A hurricane watch is issued when hurricane conditions, which include sustained winds greater than 74 miles per hour, are possible in the area within 36 hours. A hurricane warning is issued when these same conditions are possible in the area within 24 hours. The damage caused by a hurricane results from a number of aspects in the storm. Huge amounts of rain are to be expected with hurricanes and a large hurricane can dump dozens of inches of rain in just one or two days, much of it inland. That amount of rain can wreak havoc by causing inland flooding. This can totally devastate a large area around the hurricane ‘s center. High-sustained winds typically cause structural damage and these winds can also roll cars, erode beaches, and blow over trees. The prevailing winds of a hurricane push a wall of water, called a storm surge, in front of it. If the storm surge happens to occur at the same time as a high time, it can cause beach erosion and significant inland flooding. Ocean front properties are most susceptible to damage from hurricane storm surges, when ocean waves are very high and strong because of the strength of the hurricane ‘s winds. 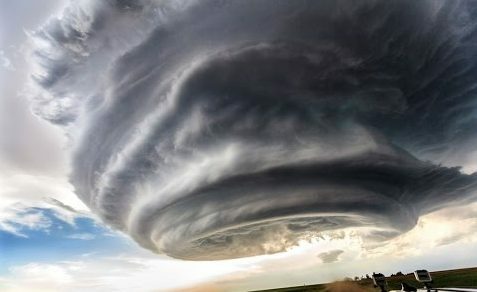 Hurricane winds often spawn tornadoes, which are smaller yet more intense cyclonic storms that cause additional damage. The extent of a damage caused depends on a couple of different factors, including the category of the hurricane, whether the right or left side of the hurricane strikes a given area, and whether the storm comes ashore head-on or just grazes the coastline. The right side of a hurricane is likely to cause more damage because the wind speed and the hurricane speed-of-motion are complimentary. On the left side, the hurricane ‘s speed of motion subtracts from the winds speed. The combination of winds, rain, and flooding can level an entire town and cause significant damage to cities far from the coast. Once a hurricane forms, it is rated on the Saffir-Simpson Hurricane Scale, which has five categories. Category one is the least damaging and includes storms with wind speeds 74 to 95 miles per hour. There is some flooding likely and little to no structural damage. Category two storms include wind speeds from 96 to 110 miles per hour and are more likely to cause roof damage. Category three storms have wind speeds much higher than the lower two categories and include much structural damage to homes and mobile homes along with severe flooding. Category four storms have wind speeds from 131 to 154 miles per hour, causes flooding inland, and cause major structural damage. A category five storm is by far the worst and has wind speeds in excess of 155 miles per hour, causes serious damage to most wooden structures, and causes severe flooding further inland.